I had never used a goose egg before my friend Vana brought me three, having just visited her parents’ farm… I’m not sure that I had ever actually even seen one before. You don’t find many recipes requiring goose eggs. So, what to do with goose eggs? They can be substituted for chicken eggs, the only problem being their size. You can see from the picture that I either made a very small sponge or had some very large eggs. I weighed mine and they were each the equivalent of 3 to 4 large eggs. If you have a recipe requiring three eggs and a goose egg weighing the same as three eggs, it’s easy. I thought it would be a great opportunity to make a plain, old-fashioned Victoria Sponge, and to do it the old-fashioned way. Victoria sponges used to be made by weighing the eggs and using the same quantities of flour, sugar and butter. So that’s what I did. I weighed my goose egg (with the shell on) and it weighed 267g. Therefore I needed 267g SR flour (I cheated and used self raising to avoid having to work out how much baking powder I would then need), 267g butter and 267g sugar. And about a teaspoon of vanilla essence. When you have your quantities, cream the butter and sugar until pale and creamy. Add the beaten eggs, one at a time (or some at a time if you are using a goose egg), to the butter mixture. Mix in the vanilla essence. Make sure it is all well combined. Sieve the flour and fold into the mixture. This quantity of mixture needs to be divided between two greased 8″ sandwich tins that have been lined on the bottom with greaseproof paper. 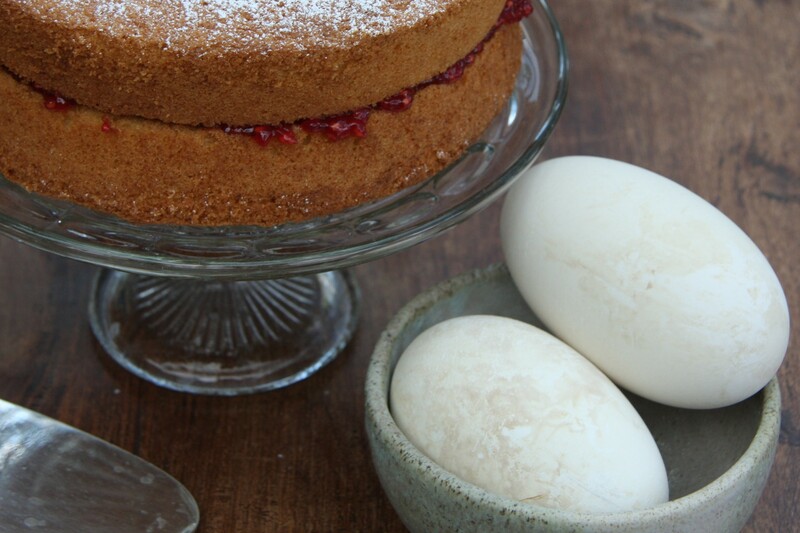 An average Victoria sponge would use 4 hens’ eggs and needs baking for 25-30 minutes at 180°C. There is a general rule of thumb that can also be followed for making this type of sponge, but it only works with the old imperial measures. I have to admit that most recipes I learnt as a child I still do in pounds and ounces rather than grams. 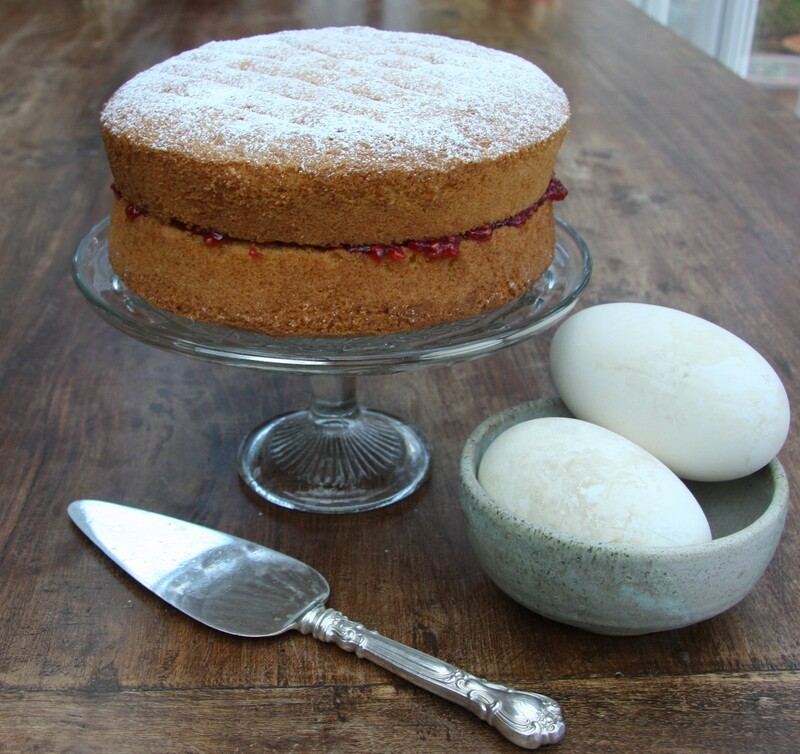 For Victoria sponge you need twice as much in ounces of the other ingredients as the number of eggs you are using. So, 8oz sugar, 8oz butter, 4 eggs and 8oz SR flour. Or 6oz sugar, 6oz butter, 3 eggs and 6oz SR flour. Whenever I make Victoria sponge I always start with the number of eggs I’m going to use and weigh the rest out in ounces. And I make it a lot as it is still my favourite base for cupcakes. So the main question now is what to make with the other two. Thanks Vana! It must be a bit different but without trying another at the same time I couldn’t really tell. It was delicious though. Looks divine, and so completely perfectly formed – I’m in awe! All my cakes require some serious work with a palette knife to rebalance them; your sponge is just beautiful. Thank goodness we can’t absorb calories by just swooning over it online…. – This particular measurement for a cake is ‘very’ interesting. In ratio, that is lots of butter! It must have a very buttery smell and taste (yum)! At what oven temp and for how many min do you bake? – Do you know why it is called Victoria sponge cake? Hi Fae! It’s a weight ratio rather than volume so maybe it has less butter than you think? I always think of it as quite a plain cake! It’s about 25-30 mins at 180. I have looked up the conversion and I think it would be 1 and three fifths cups of flour, 1 cup sugar, 2 sticks butter and 4 eggs. And about 2 teaspoons baking powder. I had always assumed it was called Victoria Sponge after Queen Victoria – I just checked and that is correct, sorry didn’t think to mention that! Would love to hear how it goes and what you think! 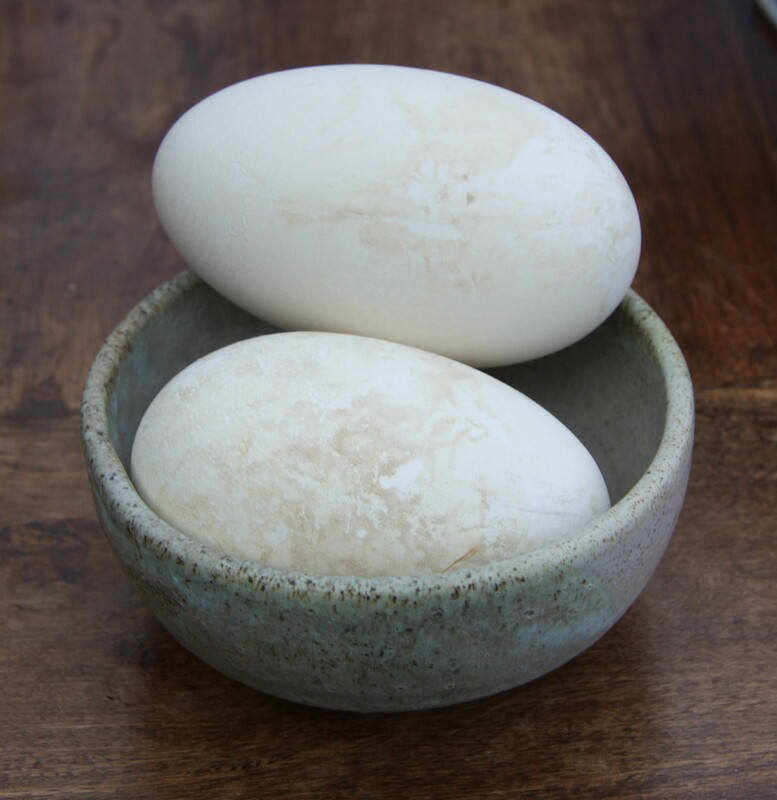 I love, love, love the idea of using goose eggs for baking! Your photos are wonderful, and this cake looks delicious. Thanks for sharing. Valuable info. Fortunate me I found your website by chance, and I am surprised why this accident didn’t happenedd earlier! I have used goose eggs in the past. excellent sponges using Victoria recipe. I’m now a about to make another thanks to a feathered friend. They are delicious – enjoy yours! I just finishing mixing this cake and putting in the oven. I used two goose eggs. My batter was thick, like brownie batter. Did I miss the liquid or did I do it right? Thanks. Goose egg custard tarts are the best. One goose egg will make a large flan size tart. That sounds like a great idea, thank you!